In the conclusion to the Final Fantasy XIII trilogy, even time is an enemy. In an interview with Famitsu (translated by Andriasang), Square Enix has confirmed some details about the conclusion to the ongoing Final Fantasy XIII saga. 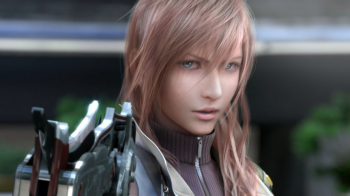 Lightning will take the helm once more for what will be her final outing, Lighnting Returns: Final Fantasy XIII. The game promises to be a shorter experience and will apparently be a rather different kind of Final Fantasy. Lightning Returns is based around a doomsday clock timer. Following the events of XIII-2, people have stopped aging and the world is doomed to end in thirteen days. The days will progress continuously, with each in-game day corresponding to between one and two hours of real-world time. Clocks will litter the game's cities, giving a constant reminder of the passage of time. Once time's up the game will end, but it will be possible to hold back the clock by completing certain quests. Players will have to beware, though, as the remaining time can shift forwards as well as backwards depending on who they choose to help. The curtailed time means that Lightning Returns is designed as a much shorter game than its counterparts, and is meant to be played through more than once. Square Enix has also changed the combat system significantly, making fights far more active. The ATB gauge from the other Final Fantasy XIII games makes a reapparance, but the way it's used is rather different here - instead of inputting commands via a menu, abilities are assigned to buttons on the controller, and players will be able to move freely around the battlefield rather than being rooted to the spot. Some areas of battle will reportedly be timing-based as well, though whether this is just a synonym for "quick-time events" or will allow for something deeper is unclear at the moment. To allow players to better concentrate on the more active system, Lightning will fight by herself. The game's conclusion will apparently mark a happy ending for Lightning's story, but despite the supposed replayability there will only be one ending. It's not quite clear yet how Square Enix intends to make replays worthwhile, but at a base time of between 13 and 26 hours this certainly looks like it will be a much shorter Final Fantasy experience. According to the interview, Lightning Returns is currently about 30% complete, and is slated for a release on PS3 and Xbox 360 in 2013.